I had a serious baking marathon this weekend. 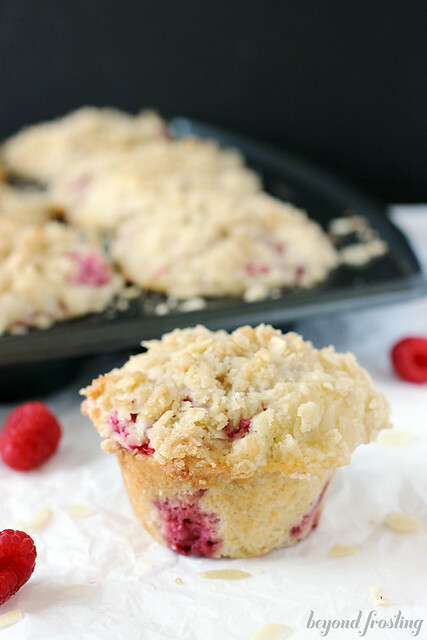 In total, I baked and photographed 10 recipes, plus two additional recipes that were a fail. I couldn’t even believe that I managed that much in two and half days. Needless to say I am a little exhausted! I have a lot of fun things coming up the next few weekends and I needed to prepare to step away from the kitchen. Let’s just say it was a good weekend for my boyfriend to be out of town. I took over the entire kitchen and living room with baking and photography supplies. This Lemon Coconut Poke Cake was one of the first recipes I baked this weekend. It originally started out as a “Better than Easter” Poke Cake, but my friend Ashton made one last year. 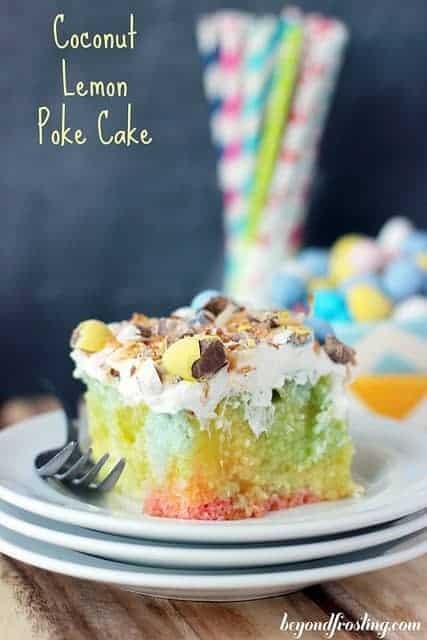 The idea of this poke cake is spring. 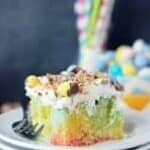 It is a pastel tye dye cake with a lemon pudding filling and coconut whipped cream. 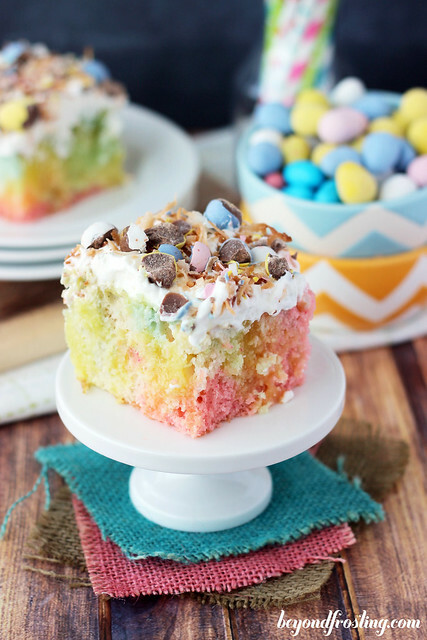 This cake is topped with toasted coconut and crushed Cadbury Chocolate Eggs. It the perfect Easter celebration cake. To make the tye dye cake, you simply make a cake batter according to the box instructions. Then you divide the cake batter into four bowls and add food color to three of the four bowls. In order to achieve a soft pastel color, I used just a tiny bit of food coloring. It is important to keep one of the bowl as the natural batter color so that there are not too many colors mixing in the cake. Once all the batter is poured, you can gently swirl it with a knife. The flavors of this cake can be altered to your suite your needs. I like the lemon flavors because it’s very refreshing. I choose to make a homemade coconut whipped cream instead of using Cool Whip for this cake. I know a lot of people don’t care for Cool Whip. Quite honestly, it doesn’t bother me at all, but I was happy to change it up for this recipe. Plus, I just love homemade whipped cream. The texture is unbeatable. Have a little fun with this one! 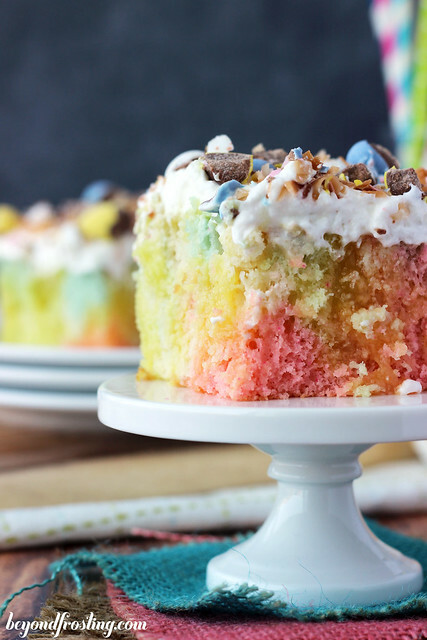 A tye dye cake with a lemon filling and coconut whipped cream. Mix cake batter according to the instructions on the box. Once mixed, divide into 4 bowls. Each bowl should have one cup of batter, the forth bowl will have more than one cup. The bowl with the most batter should stay white. The other 3 bowls, mix in your food coloring of choice. 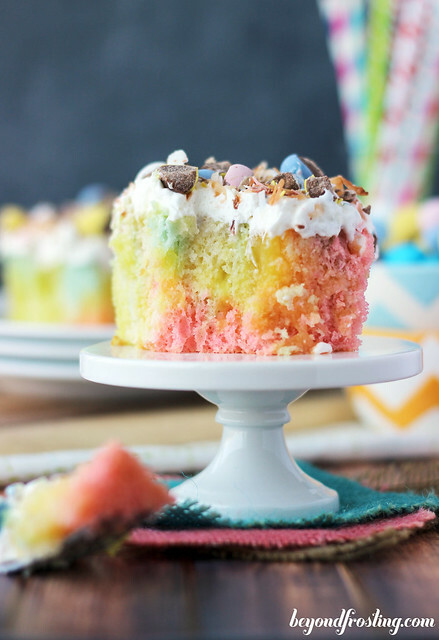 In order to get pastel colors, start with one small drop of food coloring. I used pink, blue and green. Once all batter is mixed, pour each batter one color at a time into a 9×13” pan. Pour colors throughout the pan. Once all colors are added, gently run a butter knife through the batter to swirl the colors. Careful not to over mix the colors. While the oven is still on, toast the coconut. Spread out on a baking sheet that is lined with parchment paper or baking mat. 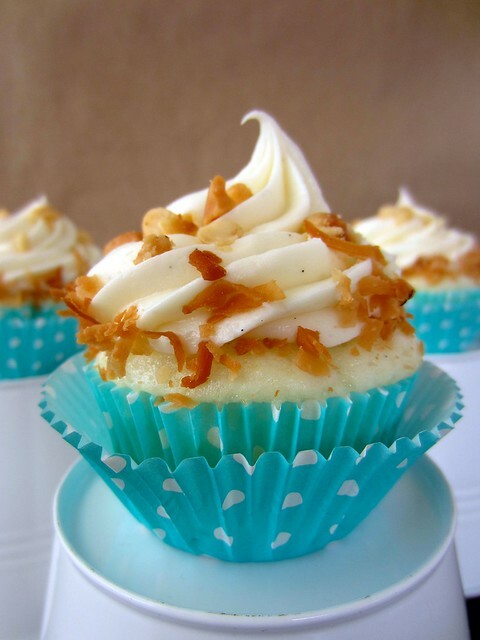 Bake until coconut starts to turn golden brown. Remove from oven and allow to cool. When the cake has cooled, prepare the pudding layer by mixing instant lemon pudding with 4 cups of cold milk. Before the pudding sets, pour it over the top of the cake slowly and put the cake in the fridge to let the pudding set, about 15 minutes. Prepare the whipped cream. Put the bowl and whisk attachment in the freezer for 5-10 minutes to get them really cold (this step is optional, but a common practice I use.). In cold mixing bowl, pour in heavy whipping cream and beat on medium speed for about 3 minutes. Add powdered sugar and coconut extract. Mix and increase speed to medium high. Beat until stiff peak form. Spread whipped cream over the top of cake. Crush the Cadbury Eggs by placing them in a Ziploc bag. Gently tap with a rolling pin to break open the eggs. You can top you cake with toasted coconut and crushed Cadbury Chocolate Eggs. This cake is so much fun, Julianne. Love the groovy colors! Thanks girl! I saw your cake on Facebook and I wanted to dive right in!